The PlayGarden provides recreational, and therapeutic, opportunities for children of all ages, with varying mental and physical abilities. 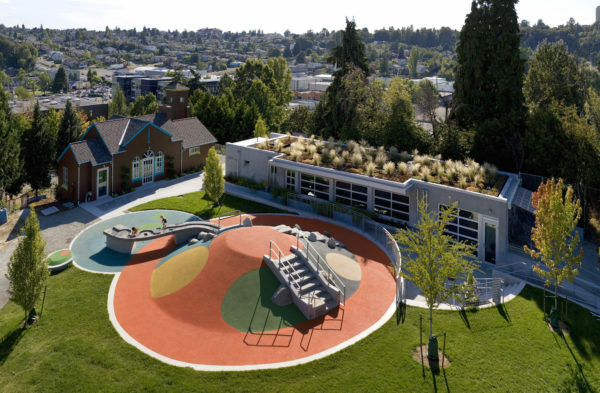 In collaboration with the Seattle Parks Department, child therapists, and landscape professionals. babienko architects spearheaded multiple sustainable features, including FSC certified wood, passive ventilation, radiant hydronic heating, insulated concrete form walls, green roof, and an on-site storm water management system. babienko architects has calculated an EUI of 56 kbtu/sf which is compliant with the AIA 2030 challenge for high performance building.